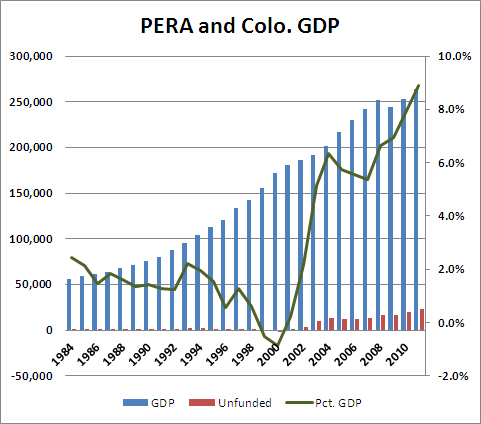 Last week, former PERA Executive Director Miller Hudson penned an op-ed for the Denver Post, arguing that PERA’s situation has improved to the point where we need not worry about it, and that no further tinkering with it is necessary (“There is no need for panicky ‘fixes’ to PERA“). Unfortunately for the taxpayers of Colorado, Mr. Hudson’s comforting conclusions are belied by some uncomfortable facts. Let’s begin with where Mr. Hudson places the blame for the current funding problems. He identifies one of them correctly – overly generous benefits that amount to promises that cannot be kept, except at great expense. He is also correct that the dot-com bubble was fool’s gold for the legislature, which led it to create the overly-generous benefits. 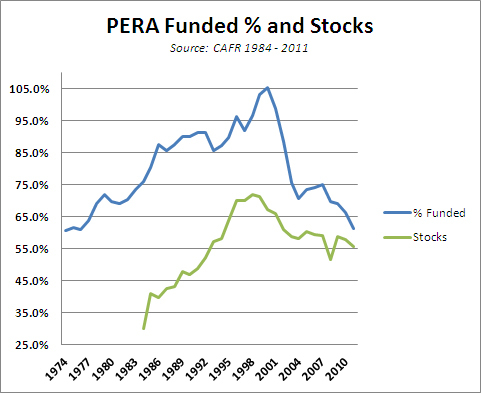 This chart also shows the folly of relying on long-term returns to determine a fund’s solvency. If a plan is underfunded, adding additional return may look like the way to catch up. But along with that additional reward comes additional risk and volatility. When the portfolio has a bad year, as in 2000, 2001, and 2008, it doesn’t have the option of drastically reducing its payout that year, as you or I would with our own retirement accounts. The need to pay benefits regardless of the fund’s annual return can put it in a hole that it can never recover from. 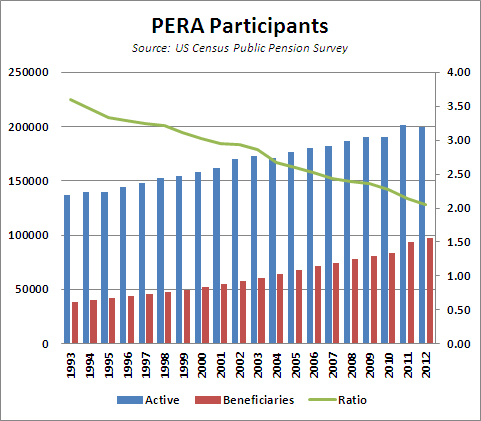 PERA’s estimate of 8% may indeed be a realistic return over 30 or 40 years. But benefits need to be paid when they need to be paid, and the results of this thinking are all too obvious in the above chart. This is a result of the very supplemental payments (SAEDs) that are designed to save the system from ruin. 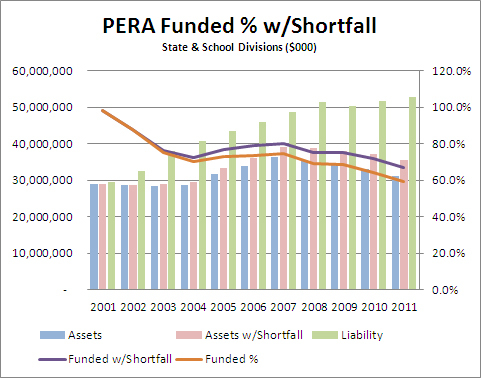 PERA is correct that the supplemental payments were envisioned as being shared between the districts and their teachers. But with many, if not most, school boards under the thumb of the teachers’ unions, they have decided to have their districts absorb the entire supplemental payments. 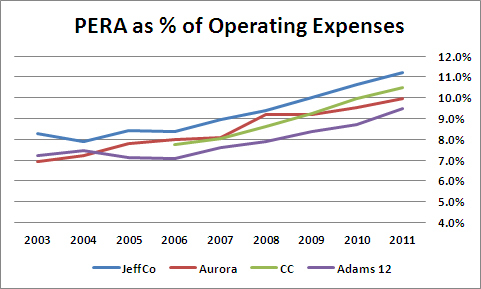 This means that as of 2011, for four major Denver-area school districts, roughly 11% of their operating expenses were going to teacher pension plans, money that could have gone into the classroom. All of these changes are designed to increase transparency, increase accountability, and decrease conflicts of interest. All of them are designed to increase fairness, and increase the likelihood that PERA retirees will be able to rely on promises made to them. It is telling that each of these changes – every last one – has been opposed by PERA and its allies in the public employees unions here in Colorado. And it’s enough to make you wonder who’s really panicking.